Swept hand finished framing range with any finish… from gesso and paints to gilts and gold leaf! Printmaking HotplatesHere is our range of Printmaking Hotplates, Our hotplates have a range from 0c to 120c and are very easy to use and set. They are easily cleaned and the smaller models are moveable so if you want to take your hotplate with you to workshops you can do. If you want a large Hotplate that you want as a static unit for your professional printmaking studio or workshop then you will find what you want here. All of our hotplates are made so that you can just plug them in and not worry about using up lots of power. They have feet that lift the hotplate up off the workbench and the flat surface of the hotplates are made of Aluminium so they are easily cleaned and don’t oxidise. If you would like a size that you do not see below please get in touch for a Bespoke price. 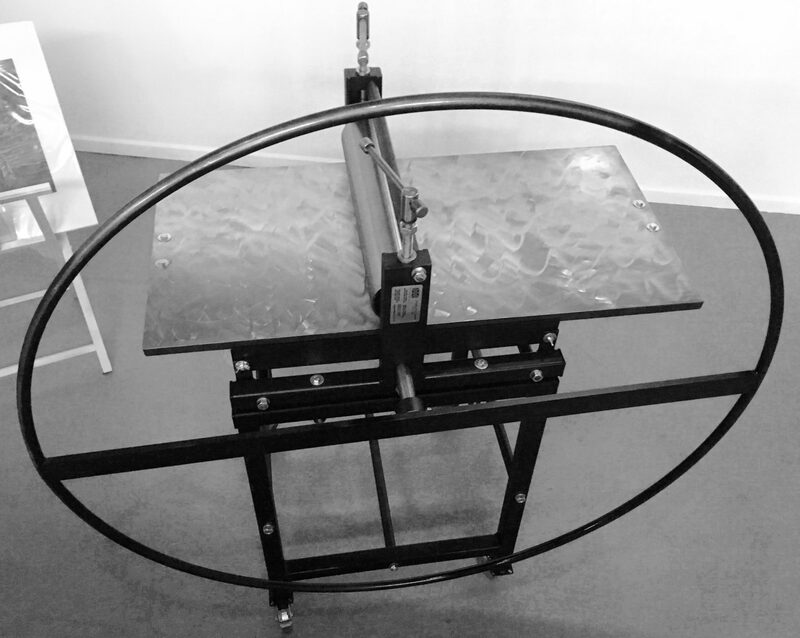 Etching Press BlanketsWe sell a great range of etching press blankets for you to choose from. We not only sell etching press blankets but also use them here our printmaking studio and Gallery in Ironbridge. Our Printing Matt comes with each press so you can get printing straight away. If you need a replacement or you would like the traditional printing blankets they are here. Many people love using our one printing Matt that we supply with the press as the results are fantastic, follow this link to see prints made using this one printing blanket. Other people prefer to use the two or three traditional blankets. All different blankets will give different results so its best to experiment to find the results you want. If you would like any help with your choice please give us a call. We can cut any of our blankets to any size you require. Relief Printing Runners Here are our runners that we have available to purchase, they work with any press as long as you have a gap big enough between your rollers. (One set comes free with your press, if your buying a press from us) Here is the list of thicknesses that we make and sell but if you need bespoke please call and we will be able to quote you. 2mm, 3mm, 4mm, 5mm, 6mm, 8mm, 10mm, 12mm, 15mm, 20mm , 25mm , 30mm If your purchasing these runners for a press that is not ours you will need to check that you can get runners in between your rollers before you buy from us because we will cut these to your sizes and they are not refundable. Lino Plates UnmountedOur Hessian backed traditional Lino plates come in several different sizes and you can purchase packs of 5 or 10. We have Lino Registration pins and runners if you are wanting perfect registration. If you need any help send us an email or call for more information. Mounted Traditional LinoOur Mounted Traditional Hessian Lino is mounted onto an 18mm fibreboard block, giving extra rigidity for printing. SoftCut Lino UnmountedOur Softcut 3mm thick Lino Blocks are super smooth which makes cutting very easy. The cutter glides through the surface of the plate with minimum effort. These come in 4 different sizes and you can purchase them in packs of 5 or 10. If you are hand-printing these Lino’s it is possible to get good registration however if your using a printing press its best to either mount them yourself or purchase them mounted already as these plates swash very easily. The below information is a small snippet out of our Maintenance and Instruction manual. The full set of instructions explain how to put your press and stand together, how to maintain and look after your printing press and help you print. You receive one of these when you purchase a press from us. If you would like any further help we run many workshops throughout the year at our beautiful print Gallery in Ironbridge. If you need any help please do not hesitate to give us a call. Your press is a direct drive press that is made using fabricated steel, dense walled cylinders and pre-oiled bearings, it is available with either a star or round wheel or both. 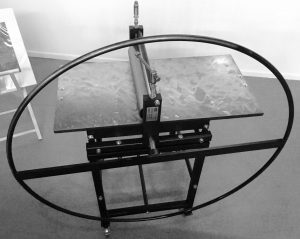 The GunningArts Presses are easily maintained and include safety features such as bed safety stops, press lock down as well as easy removal of star or round wheel and press bed. We provide runners with your press so that you can easily set your pressure to print Lino or woodblocks or any other thick plates. There is also a blanket provided with the press so you can get printing straight away. We suggest you try using a single blanket before you go ahead and purchase the traditional three blankets. The top roller on your press has been lathed perfectly so you do not have any in-discrepancies. This means that you can print without a blanket if you need to on certain materials like wood blocks or lino. We do suggest you use a blanket when printing from metal as you can mark your roller. If you are going to purchase the traditional three blankets we suggest you purchase them from us. We sell the traditional blankets and they are dry cleanable making them easy to look after for yours. The maintenance instructions are also included here for you; it is important for you to make sure you maintain you press to make sure you keep it in working order. If you need any help with this, please don’t hesitate to get in touch. Over 40 years ago Dave Gunning designed the first Gunning press so that he could have his own press at home in his print studio. Forty years later thousands of printmakers all over the world have Gunning press’s in their studios, schools and Universities. Thank you for purchasing one of our presses from us, if you ever need any technical support please do not hesitate to get in touch with us. We offer a wide range of workshops in our print studio exploring both traditional and contemporary methods of printmaking. We also have a large beautiful Gallery in Ironbridge (a UNESCO world heritage site) where we exhibit both our own work and other printmakers work, so it’s well worth a visit. Please keep us updated of the work that you produce, we look forward to hearing from you. The top roller is lacquered with clear varnish, if this starts to come off at any time, this will not affect your printing quality however visually if you want to keep your press looking brand new you will need to re lacquer the top roller. You can buy this clear lacquer from any Halfords store. The printing press pressure is set by adjusting the tommy bars. Left to loosen and right to tighten. Every 6 months or so depending on how much you use your machine just put engine grease in all the moving parts of your press, this will keep your machine working perfectly. Do not use WD40 as this is white spirit based and will eventually evaporate. We suggest you use engine grease; this will not evaporate over time as it is oil based however it does need to be replaced every 6 to 8 months depending on how often you are using your press. The press bed is made from steel and marine ply. Your steel surface on the bed is lacquered with clear lacquer which allows the surface to be wiped clean after printing. It has two safety stops on the bed also to make sure it does not fall out when printing. Do not clean your plates on the press bed. Always use tissue paper on the press bed to keep it as clean as you can. The printing blanket that we provide with the press is substitute for the etching blankets, it does the same job as the traditional 3 blankets but do not last as long. You can upgrade to the three traditional blankets, they are 80% unwoven wool and can be dry-cleaned. You can use all three together or two or just one blanket it you like. If you need to replace your blankets we sell them separately, or if you need a set we also sell them as a set. We sell them off the roll in black or light colour. Winding one pressure adjuster down without the other one continuously. If you drop a press from a great height, or if you try to put things like metal screws or sharp objects through the press. Not maintaining the press including not cleaning, greasing or looking after the press. If you leave the blanket wet in the press all the time this will eventually rust the bed. If you are tipping white spirit over the press bed to clean printed plates the white spirit can wash away the grease in the bearings. Moving parts need grease. The Gunning Arts Etching Printing Presses are made with loving care so they should be treated accordingly. To help ensure that your press is kept in the best possible condition we suggest the following. Keep the rollers clean and avoid getting ink on them. Every 6 to 8 months clean the rollers off to get them shiny clean, if they are a mess use white spirit and sandpaper, then spray with Halfords clear car lacquer. Do not put foreign objects into the bearings or under the rollers. Every 6 to 8 months grease the bearings (these are the blocks that hold the rollers in place) this is a moving part so these must be greased to keep the press working. Use engine oil or grease from halfords. Keep the press bed clean and tidy and clean off any ink that is left on the bed after a day’s printing. Do not clean plates on the bed of the press. When using wd40 or white spirit to clean the press do not spray near the press. Spray the cleaner onto a cloth and then use cloth to clean press. Every 6 to 8 months clean the bed off and sand down and spray with Halfords clear car lacquer. Please note this is not a conclusive list of do’s and don’ts but merely a guide to assist you in keeping you press in a good condition. Should you need any information or assistance please contact us. We run many workshops throughout the year at our beautiful print workshops and Gallery in Ironbridge for both beginner and advanced printers for dates and further information please contact us.